ANNOUNCEMENT: November, 15, 2018 - All donations for the Black Mountain Building Fund will be matched dollar for dollar up to $5,000 thanks to a generous pledge from our Platinum Sponsor, Trek Bicycle Superstores! SDMBA continues its strong alliance with the proud team of City of San Diego rangers at Black Mountain. Shovels finally hit the ground on the Black Widow Trail on December 1, 2018. This first work day attracted almost 80 volunteers, many of them first timers! The event even attracted some media attention. There will be many more work days before this project is complete so check SDMBA channels for updates. The final resolution has been reached on the arsenic exposure on Miner’s Ridge during the late spring of 2018. The Ranger staff has installed a couple short sections of gravel filled road mats that effectively keep the highest concentration of dirt contained. All legal trails on Black Mountain are now open for use. 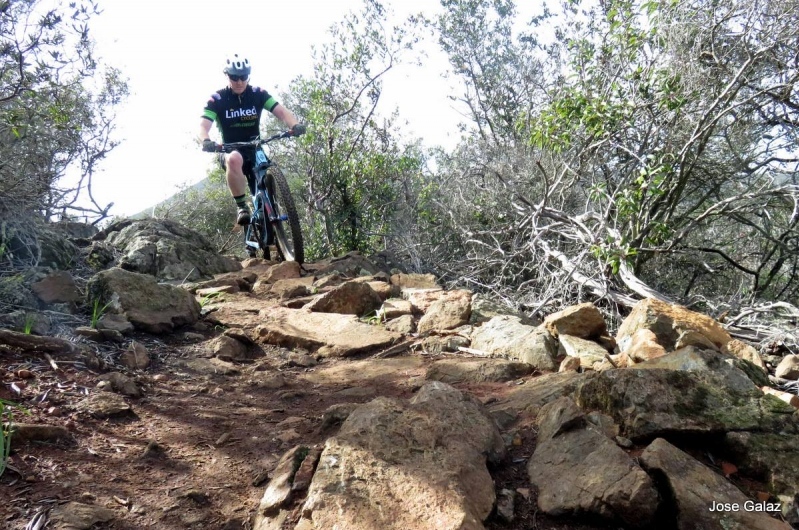 SDMBA received a generous grant from REI for $15,000 for the planning and construction of the Black Widow Trail. We have also received generous contributions from individuals including, Trek Superstores, Zoic Clothing, Guy Sutton DDS and over 100 individuals. Thank you all! First official flagging of the new Black Widow alignment began in late summer 2018. The final plan was approved in March of 2018 but the nesting season for the California Gnatcatcher, a federally protected bird, began during the same month so, no building or flagging was allowed. Corridor clearing began in early December and work will continue through winter 2019. This build may take more than one season but with the help of many volunteers, the right amount of rain, and our new motorized wheelbarrow we will see how far we get. Formal trails requests will be submitted to the city this summer to extend the Manzanita Loop to the north and also include a connector to the valley below on the north side of the open space, a connector to the east side on Cuca Street from Manazinta, and a new alignment out of Hilltop park to replace the very eroded service road leading straight up the hill. A new alliance has been formed between the Estate’s HOA (Mansion estate homes directly north of the Miner’s Ridge parking lot) and the Black Mountain Trail liaison. The Estates are seeking trails to link up their property with Black Mountain. An alignment that will start in the bottom of Lusardi and wind its way through the community, ultimately ending at the bottom of the Carmel Valley Rd bridge/Ahwee trail is being looked at. The HOA is on board and SDMBA and the HOA is actively working with the city for permitting of the portion of the trail that crosses into Open Space land. This will be a great replacement for the original Lusardi climb lost to the construction of the Estate homes. All the trails on Black Mountain are 100% volunteer created and we can use all the help you can provide. In early 2010 a task force was formed to update the Black Mountain Open Space Park master plan. Working with the community and trail users, Rod Simmons and Senior Ranger Ed Christensen walked the surrounding hills to find optimal routes to take advantage of the terrain. The process would involve multiple agencies and a great amount of review. It took nearly 5 years for the master plan update was completed in 2014. It included proposals for nearly 10 miles of trails, acquisition of private land, and several new trail heads to accommodate the ever growing user base. Starting November 2014, the first new trail construction began with the start of the Lilac Canyon trail. It would connect the Glider Port parking lot with the Miner’s Ridge trailhead parking lot. 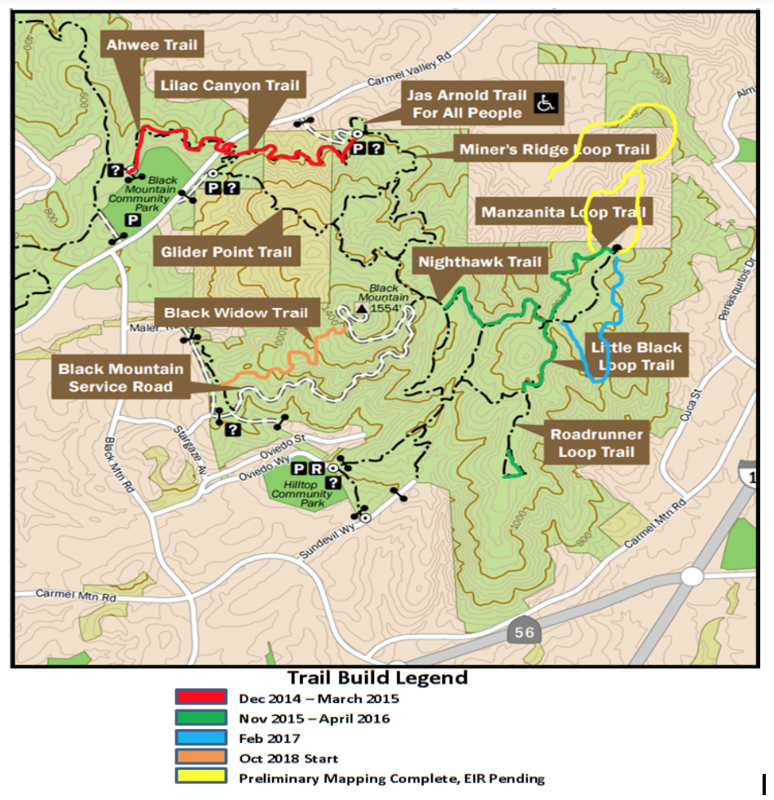 In early 2015, the Awhee trail linking the Lilac Canyon to the Black Mountain Open Space Ball Fields was built. The event was supported by 120 volunteers and the 7/8th mile trail was completed in one day. These two trails removed all trail users from the nearby Carmel Valley Road, greatly increasing safety and the user experience. In May of 2015, City Council Member Mark Kersey, Black Mountain Ranger Staff, City Open Space Representatives, and Trail Leads Rod Simmons and Matt Bartelt, hosted a ribbon cutting ceremony officially opening the trail segments to public use. Both trails received high praise for their design and functionality. For the first time, users could circumvent Black Mountain without ever leaving a trail. The following fall/winter of 2016 the trails on the East Ridge of Black Mountain were started. Utilizing American Conservation Experience (A.C.E), the corridors were cleared in anticipation of a large trail build season. Starting in December and meeting every Saturday until early April, 2016, over 250 different volunteers representing all facets of the trail user community hiked with tools to the trail build site. By the end of the build season, another 2 ½ miles of single track were added, allowing better access to the East Ridge trail complex.